The Unseen Valentino Zagatti Collection, an exhibition displaying one of the world’s most famous collections of whisky, has officially opened in the Netherlands. Thijs Klaverstijn takes a look at the history of the collection, and some of its most significant bottles. It is probably one of the biggest pieces of whisky news of the past decade; signifying whisky has truly entered the realm of investors. The acquisition of the renowned Zagatti collection by Scotch Whisky International (SWI) in 2014, a Dutch investment firm led by Michel Kappen, made headlines around the world. The 20 private investors backing Kappen spent millions on the collection, which counts over 3,000 bottles, most of them extremely rare. Now, almost three years after the sale was finalised, Kappen lives up to the promise he made Valentino Zagatti with the opening of The Unseen Valentino Zagatti Collection – a permanent exhibition in a private museum in Sassenheim, a Dutch town just 15 minutes from Schiphol Airport. It was this pledge that ultimately made Zagatti decide to sell his collection to Kappen, rather than to another party. Zagatti’s impressive collection might not be the largest in the world – in Italy alone, the land of collectors, there are several that boast a higher bottle count. But part of what makes his collection remarkable is the enormous depth and diversity. He collected close to 300 different brands, and at one point had 229 different bottles of Glen Grant, a very popular brand in Italy. However, it is the personal story of Valentino Zagatti – now well into his eighties – that really puts his achievement in a different light. During the Second World War, at the tender age of 11, a landmine caused irreparable damage to his vision. Despite this enormous tragedy he never lost his joie de vivre, and in the years after the war he set out to become one of Italy’s more well-known and respected accordion players, racking up prizes at a range of festivals. Until the late ‘50s, Zagatti was a smoker, burning through about half a pack a day, until one day he stopped abruptly, and decided to spend his cigarette money on something more substantial. Each month he bought a different bottle of liquor, wanting to collect all spirit brands from every country in the world. This could be Cognac from France, grappa from Italy, or vodka from Poland, and of course also whisky from Scotland. In 1960 he had collected 20 bottles, and the start of a lifelong obsession was born. Zagatti has never seen even a single bottle of his collection, nevertheless he is able to recognise nearly every one of them – if not by touch, then certainly by date of purchase. He is blessed with an amazing memory. A small date sticker on the bottom marks each bottle. Tell Zagatti the date, and he will know which bottle he is holding, even if he has purchased more than one whisky on that date. Several decades in, Zagatti had made a name for himself as a collector, which he then further cemented by releasing The Best Collection of Malt in 1999. In the book he showcased a large part of his collection. Four years later he released a second volume. Both books have been out of print for years, and over time have become collector’s items in their own right, selling at auctions for the equivalent of a VERY decent bottle of whisky. The crown jewel of the Zagatti Collection is a whisky bottled in 1843, which might very well be the oldest bottle of Scotch in the world. Not much is known about the whisky. Not whether it is a blend or a malt whisky, let alone at which distillery it was distilled. The worn label is handwritten, and from the text on it, you can make out it was a wedding gift from a father to his daughter, Atty. Then there’s four bottles of Parkmore, each of which will make any whisky enthusiast blink twice. This lost Dufftown distillery closed its doors in 1931, but the distillery buildings are awfully well preserved. The same can’t be said for its whisky, as rumour has it that when the distillery shut down, the whisky was so poor that all the remaining casks where smashed. True or not, it makes finding four bottles of Parkmore in a single collection all the more special. A little over 10 years ago, Zagatti first started contemplating selling his collection. There was interest from Italy, Japan and other places, but most were just interested in parts of the collection. Through his Dutch friend, independent drinks consultant Ronald Zwartepoorte, he came in touch with Michel Kappen and Scotch Whisky International. Negotiations took the better part of four years. Not until it was promised that the collection would stay together for at least 10 years, to be displayed in a dedicated museum, did Zagatti sign the contract. All whiskies in the Zagatti Collection – meaning every bottle included in the two Zagatti books from the turn of the century – are displayed in the museum, except for a small number of fakes that were discovered. Working on a newly commissioned book about the collection, whisky writer Hans Offringa and his wife Becky have authenticated all bottles in the exhibition. They did so with the support of most of the industry’s largest companies, like Pernod Ricard, Diageo, Glenfarclas, Edrington, Gordon & MacPhail and J&A Mitchell & Co. Located on the second floor of the SWI building, at the centre of the exhibition space, is a custom-built glass case, showcasing the oldest bottle in the collection, surrounded by a square of four large display cabinets holding other precious whiskies. Among them the 12-year-old Port Ellen Queen’s Visit, as well as several editions of Black Bowmore, the aforementioned Parkmore whiskies, and many more. Even more bottles are displayed in cabinets that line the walls of the space from end-to-end. As of right now, the plan is to make the museum available to clients of Scotch Whisky International, who can use it for meetings, or simply just come visit the collection. However, there’s talk of opening the museum one Sunday each month, to give other people a chance to visit by appointment. The Unseen Valentino Zagatti Collection has turned out to be an exhibition worthy of a man’s life’s work. For at least another seven years – which is when the 10-year deadline of the collection’s sale passes – Zagatti’s collection is preserved. If you get the opportunity to visit, don’t hesitate. The Italian collector on how he amassed one of the world’s most enviable whisky collections. 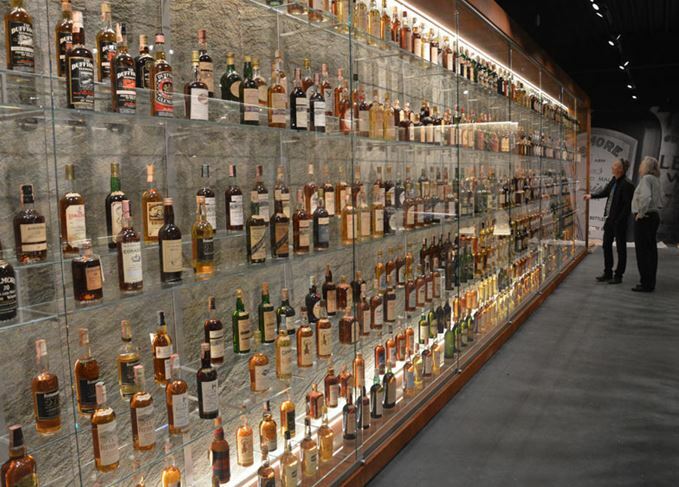 The whisky collection will be exhibited in a Dutch museum due to open later this year. The Hong Kong bar owner has developed broad tastes, from Hanyu to Laphroaig and Bowmore. Track down these public collections of rare bottles for a glimpse of whisky’s storied past. A younger and increasingly diverse generation is discovering the joys of single malt.